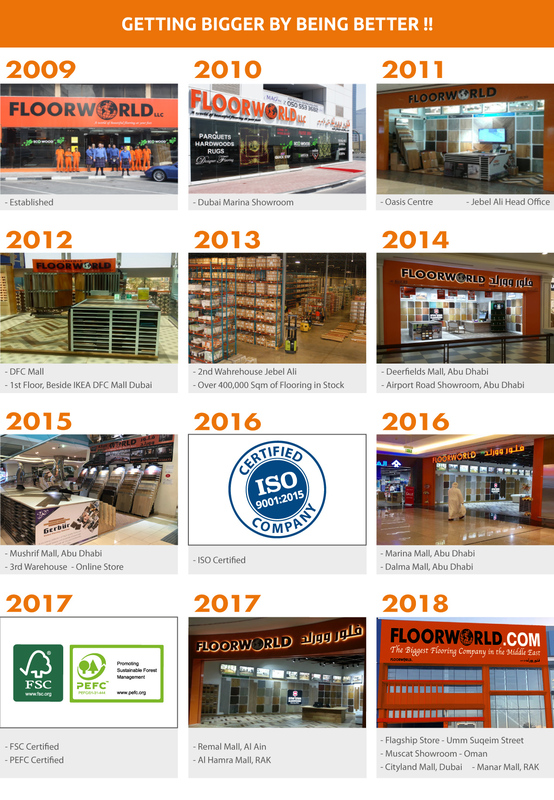 Floorworld is the largest flooring company in the Middle East with showrooms throughout the UAE and Oman. Established in 2009 with the goal of supplying and installing top quality European branded flooring products at the lowest possible prices, Floorworld has quickly grown to become the flooring company of choice for architects, contractors and homeowners. Additionally we have a distribution network of retail partners throughout the Mena region. PRODUCT QUALITY and SERVICE EXCELLENCE are the twin principles and foundations of Floorworld. These principles, in tandem with our highly trained staff and professional installation team has enabled us to become market leaders in the U.A.E. flooring market in a relatively short time-frame, a position which we achieved by ongoing commitment to our valued customers. We believe in good old fashioned customer service and to this end we pledge to satisfy our customers 100% by constantly reviewing our customer feedback, continually updating our products range to ensure we offer the latest in quality products, innovative and fashion conscious, from leading and trusted manufacturers from Europe and around the world. Our aim is to provide quality branded European flooring products at the LOWEST POSSIBLE PRICES coupled with a class leading customer care and after-sales. We believe by developing this strategy we genuinely offer the best in flooring solutions to the Middle East and entire GCC. We routinely check our competitors products and pricing to 100% GUARANTEE that we offer the lowest prices for top quality flooring. You can relax and purchase from Floorworld safe in the knowledge that your buying from the biggest flooring company in the Middle East and your saving money on that beautiful new floor of your dreams. Although we offer a huge range of elegant and durable floor coverings, we are more than just a flooring company. We are a company that believes in transparency, free quotations and ethical business practices as we constantly endeavor to retain market leadership by making sure our customers are 100% satisfied. The reason our business doubles in size every two years is simple; Our growth comes from your happiness. Please see our completed projects page for examples of our work and satisfied customers.